WW1 Reenactments Equipment : Great War Tommy WW1 Documents, Paperwork : YMCA Active Service Notepaper, 1915. WW1 Reproductions and WW1 Reenactors Equipment / Kit - YMCA Active Service Notepaper, 1915. 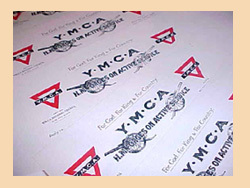 YMCA "Active Service" Notepaper, 1915. Black and red ink logo, two howitzers and "H.M. Forces on Active Service" heading, on quality cream paper. Per 10 sheets.